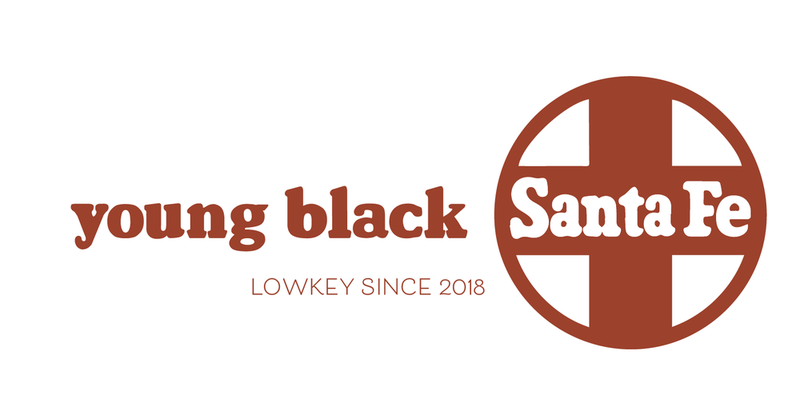 Meet Young Black Santa Fe. Zippy Guerin and I are starting a series of events for Santa Fe's young, black population. New Mexico is predominantly Anglo, Hispanic, and Native American population - and about 3% black - including African Americans, Africans, and Caribbeans. I didn't grow up culturally identifying as a black person, but as an adult, I have found that I want to connect with black people, and that opportunity doesn't readily present itself in Santa Fe. This weekend we'll be hosting our first event, a super casual happy hour. We hope that this will be an recurring event (maybe monthly, maybe quarterly) where we can network and connect. If this is something you are interested in participating in feel free to email me for the details about this weekend's event and (hopefully) future events. I created the graphics for the events incorporating the iconic Santa Fe railroad logo and this terracotta tone that in Zippy's words is a "blend of black and desert vibes."